In "A Star Is Born," Lady Gaga's fans have a chance to see her as they've never seen her before — or since. The singer, songwriter and now big-screen star stripped down for the soon-to-be released movie, going mostly makeup free and wearing her hair in a soft shade of brown with subtle highlights. But that look didn't last long. 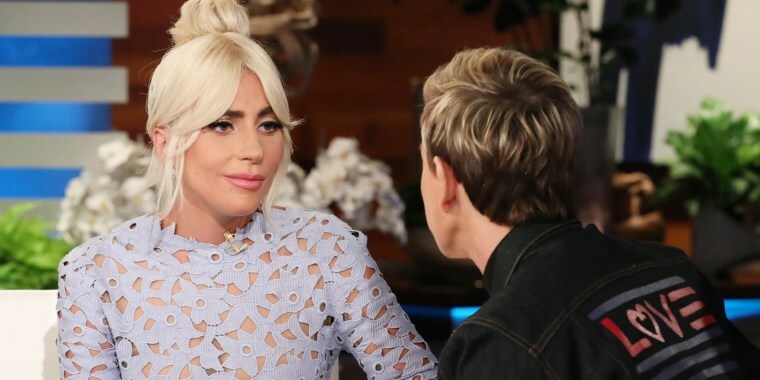 As Gaga confessed to Ellen DeGeneres Thursday, the moment she and co-star Bradley Cooper finished filming the tragic tale that intertwines music and romance, she left those dark locks behind and went right back to her signature platinum blond. "I literally dyed my hair blond the night that we stopped shooting, because I wanted to get out of it as soon as possible," she explained. "It" being the mindset of her on-screen alter ego, Ally, the ingenue at the heart of the story. Lady Gaga and Bradley Cooper in "A Star Is Born. "Warner Bros.
"Without giving away the end of the film, there is some tremendous emotion and tragedy, so I wanted to get her out," she told DeGeneres. But going back to blond hasn't really rid her of her character. "To be honest, she's still in here," Gaga said as she pointed to her chest. And, although she doesn't want to carry Ally's angst around, she is happy to keep the essence of the role — which is already earning her Oscar buzz — close to her heart. "You know, I think passion and fighting to be who you are, I think these are two of the most important things in the world," she said. "A Star Is Born" hits theaters Oct. 5.